A generously proportioned four bedroom detached family house with delightful southerly facing rear garden in this much sought after location.This fine house has gas central heating,double glazing a garage and good off road parking.The accommodation comprises an Entrance Hall with Amtico flooring,Cloakroom/W.C.Lounge/Dining room with feature fireplace and patio door to a Conservatory in UPVC with door to the garden and tiled floor.Fitted Kitchen with a full range of units,work surfaces with tiled slash back and appliances including a hob,extractor,oven and grill and dishwasher.On the first floor are four bedrooms one with built in furniture and one with ensuite Shower Room. In addition is a fully tiled bathroom/W.C. with shower cubicle. 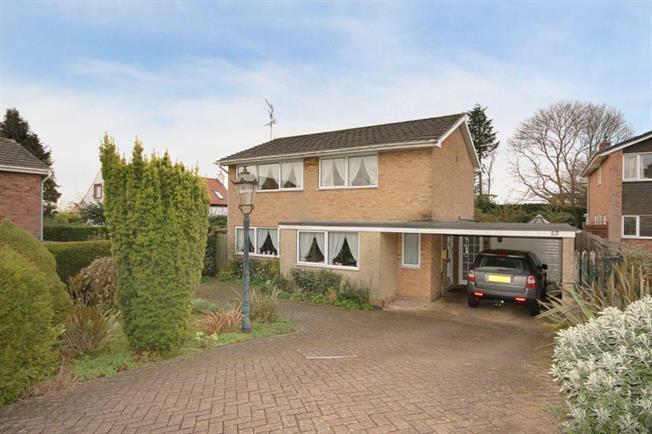 Outside to the front is a block paved drive with ample off road parking and a landscaped garden with mature conifers. There is a garage with service door to a covered porch leading from front to rear. To the rear is a southerly facing, enclosed and private dog friendly garden comprising a block paved patio,expanse of lawn, beautifully stocked mature beds and borders with an abundance of shrubs and plants.In addition there is a greenhouse,shed and store room.The property is located in this much sought after location served by excellent schooling, pretty walks,public transport services,pubs and restaurants.